Pre-heat oven to 90°C/190°F. Add egg whites to a bowl and beat together with sugar and salt until stiff. Sift the confectioner’s sugar and fold into the beaten egg whites. Purée some of the raspberries until smooth. Add meringue to a piping bag. Pipe 5-cm/2 in. wide circles onto a parchment-lined baking sheet. Leave some space between. Top with some raspberry purée and swirl with a tooth pick. Bake the meringue in oven at 90°C/190°F for approx. 3 – 4 hrs., until dried. For the topping, mix heavy cream, confectioner’s sugar, and vanilla sugar and beat until foamy. 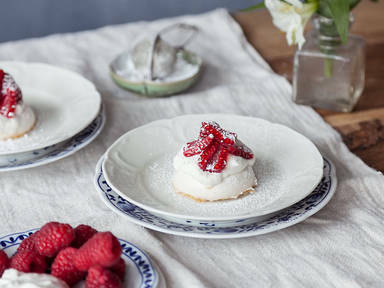 Top the Pavlovas with vanilla cream and garnish with halved raspberries. Enjoy!